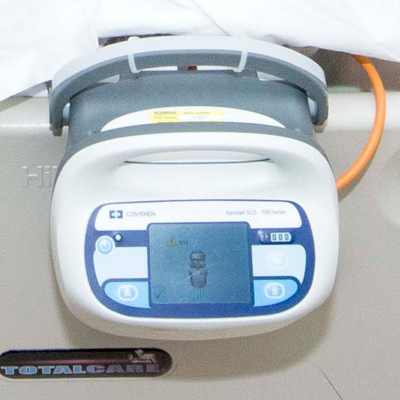 Equipment used in an Intensive Care Unit ranges from familiar equipment, such as blood pressure monitors, to highly specialised devices, such as dialysis machines. Here you will find straightforward explanations of some of the most commonly used equipment. The information contained on these pages is general in nature and therefore cannot reflect individual patient circumstances. 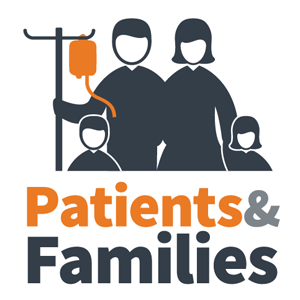 If you are concerned or unsure about anything you read, please ask the healthcare professionals caring for your family member or friend. Click a highlighted area in the image to view the details. To transport critically ill, ventilated patients. To provide room to carry portable oxygen cylinders, suction equipment, emergency resuscitation equipment, intravenous infusions and their pumps, as well as a transport monitor and ventilator. Some beds are equipped with at pressure relieving mattress. This is a special mattress that patients use when they are at risk of developing pressure areas (pressure sores). 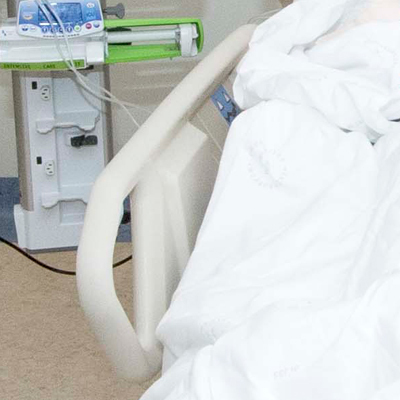 The purpose of this mattress is to re-distribute the weight of patient’s body on a regular basis so that no area is compressed for extended periods of time . The mattress is comprised of a series of individual cells, which are gently inflated and deflated alternately. During these periods of pressure reduction, the maintenance of blood and oxygen supply to the skin and underlying tissue is assisted. This helps prevent skin breakdown. 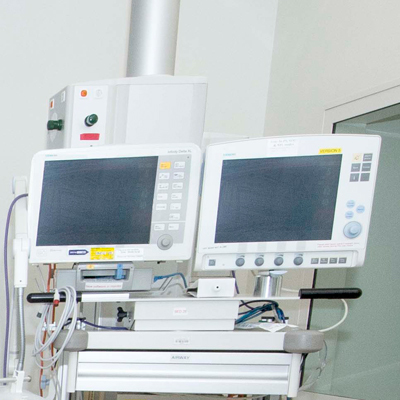 All patients admitted to the ICU are connected to a bedside monitor during their stay.The ICU monitor, which looks like a television or computer screen, provides ICU staff with real-time information on important vital functions such as heart rate and rhythm (ECG), blood pressure, body temperature, breathing rate and oxygen saturation. Less common functions include cardiac output, pulmonary pressure or intra-cranial pressure. 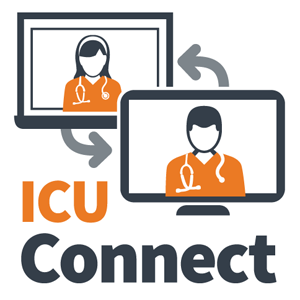 This allows the ICU to have an overview of how the patient is responding to treatment and take action quickly when problems are detected. 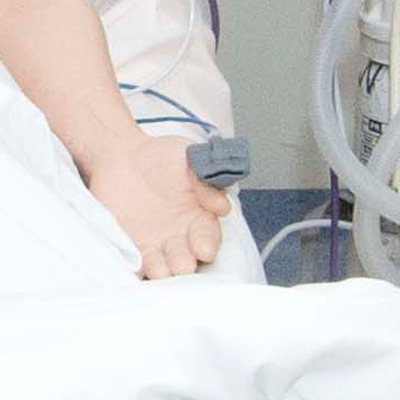 Special sensors are placed on the patient or through special catheters (for example arterial catheter. These sensors are then connected to the monitor by special leads; allowing the signal to be displayed continuously. Alarms are set to alert staff to problems however sometimes patient movement alone can cause the alarms to go off. Being attached to the bedside monitor does not hurt the patient. 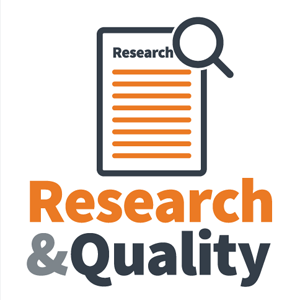 Click on the buttons for fact sheets on bedside monitors in community languages. Ventilators are commonly known as breathing machines because they support patients to breathe for themselves, or can take over breathing for a patient completely. Some people also refer to them as life support machines, although this is not strictly true. Ventilators come in many shapes and sizes but all generally work in the same way. 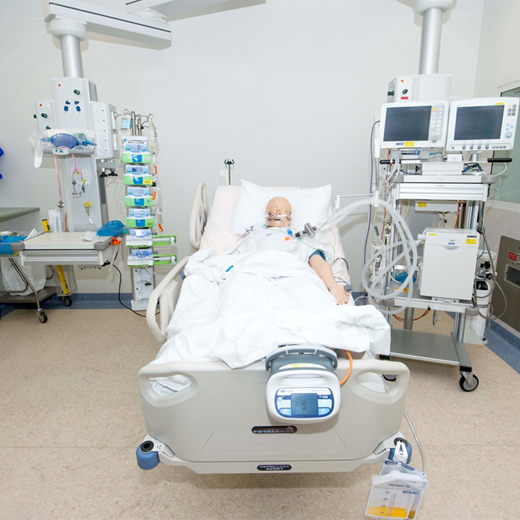 The ICU team are able to set the ventilator to give individual patients exactly what they need. This could range from assisting the patient's own breaths to full support by taking over a patient's breathing completely. 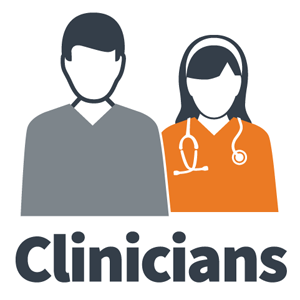 Patients who are ventilated require close monitoring, so they are allocated one nurse to look after them. To understand more about ventilators go to Breathing Support. 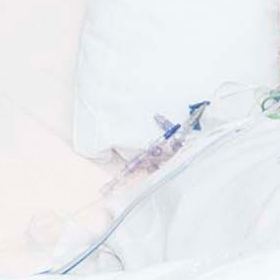 An Endotracheal Tube is a long plastic tube used during invasive ventilation. The tube is inserted placed through the mouth, down through the throat and into the lungs during intubation. 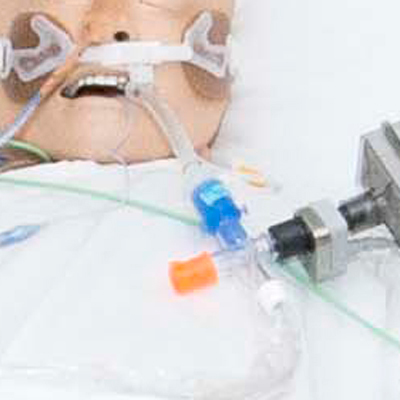 The external end of the tube is then attached to special tubing which is connected to a ventilator . 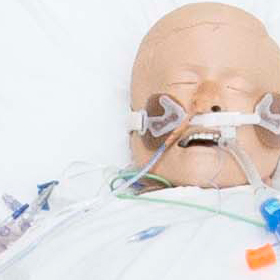 To understand more about endotracheal tubes go to Breathing Support. Click on the buttons for fact sheets on edotracheal tubes in community languages. Intravenous infusion pumps are used in hospitals to control both the rate and amount of fluid or medication that is given to a patient. 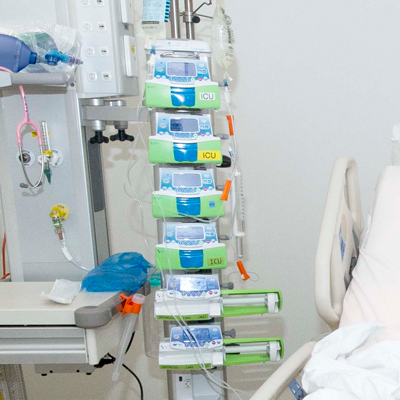 The infusion pump allows the nurses and doctors to set the amount of fluid or medication that needs to be delivered to a patient each hour. 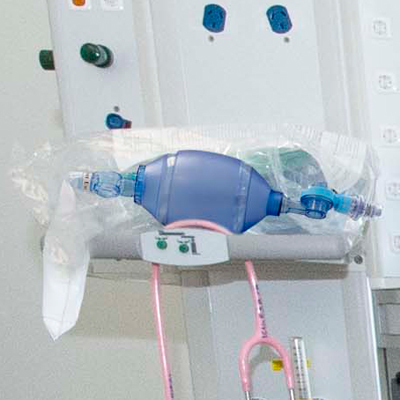 Fluid and/or medication are delivered to the patient through plastic tubing, and is connected to vascular access device . 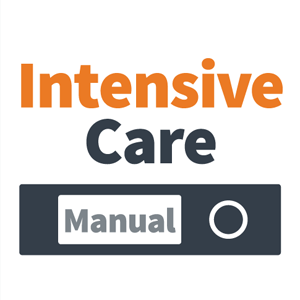 Monitoring the infusion (drip) rate is especially important when the patient is critically ill, dehydrated (dry), or requires life saving medications. You may hear the pumps alarm from time to time. These alarms alert the nurse when the infusion has finished or when there is a problem with the delivery of the infusion. A syringe driver or syringe pump is a sophisticated pump used to deliver small quantities of intravenous medications and fluids. The medication is put into a syringe which is connected to the patient via specialised IV tubing. The pump is then programmed by a clinician, usually the patient’s nurse, to deliver the medication and fluids. Syringe drivers are often used when only small amounts of medications or fluids are required. Syringe drivers have alarms to alert clinical staff when the medication or fluid has been given or if there is a possible problem preventing its delivery. As this medical device is giving the patient important medication is MUST NOT be touched by visitors. If you have concerns regarding the syringe pump please discuss them with the nurse caring for the patient. A nasogastric (NG) tube is a flexible plastic tube that goes through the patient's mouth or nose into the stomach. The NG tube is secured in place by tape. The NG tube has two main purposes. To remove bodily fluids from the stomach to prevent vomiting and possible aspiration . Usually this is brown-green fluids which are normal stomach secretions. On occasion blood or bile may be aspirated. To give medication or food when the patient is ventilated and/or is having trouble swallowing. 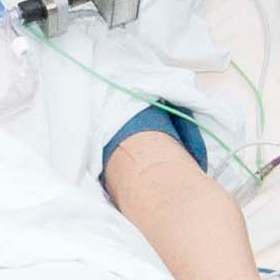 The end of the NG tube may be connected to a feeding pump, a drainage bag, a suction device or closed with a spigot. A NG tube is necessary until the gastrointestinal tract is functioning normally or the patient is capable of swallowing. Click on the buttons for translated fact sheets on NG tubes. 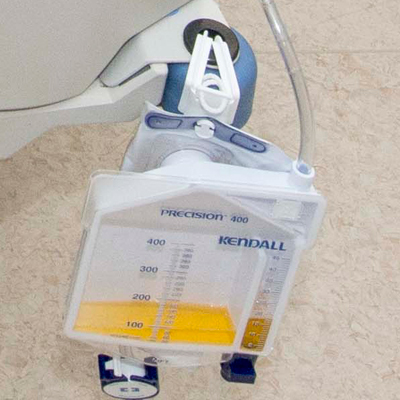 Intensive Care patients require the use of an Indwelling Urinary Catheter (IDC) to measure the amount of urine they produce and to control bladder function. An IDC is a soft flexible tube that is placed into the bladder to drain urine. The catheter is inserted into the urethra and is then connected to a urinary drainage bag. An IDC is used until the measurement of the amount of urine is no longer needed or the patient regains the ability to control urination. A Saturation Monitor (Pulse Oximeter) is a device that measures the oxygen saturation level in a patient’s blood. The oxygen saturation level represents the amount of oxygen carried in the blood. 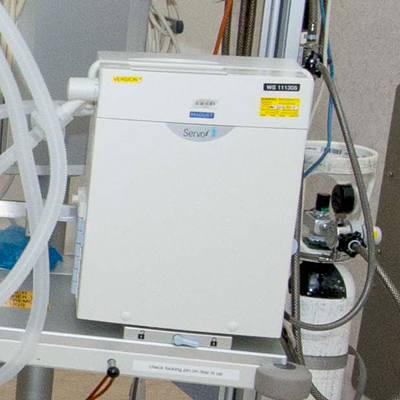 The Saturation Monitor is attached to the patient by means of a long lead and a probe. This probe will attach lightly to a patient's finger (as illustrated) or their ear, nose or mouth. The probe gives off light that is able to tell the oxygen saturation level in the blood. Sequential compression devices (SCD) are used in intensive care to reduce the risk of deep vein thrombosis (DVT) in the lower limbs of critically ill patients. SCD are sometimes referred to as ‘calf compressors’. DVTs are a serious complication associated with being immobile for a period of time. SCD consist of plastic sleeves with a number of compartments and a pump. These plastic sleeves are applied to the legs, usually over thromboembolic stockings. The pump inflates and deflates the compartments with air in a predetermined sequence. This applies pressure to the muscles of the legs and a corresponding sequential compression to the veins of the legs. This serial compression of the muscles and veins mimics the action of walking and results in moving blood through the veins towards the heart and preventing pooling of blood in the lower limbs. Pooling or stasis of blood in the lower limbs increases the risk of DVT. SCD are relatively comfortable to wear and do not restrict leg movement. A Central Venous Catheter (CVC) or Central Line is an intravenous line that is used for giving the patient fluids and / or medications. It may be used when the patient’s veins in the arms are difficult to access or when certain medications or nutrients need to be given that cannot be administered into the smaller veins found in the arm. A CVC is inserted into one of the larger veins of the body. These are found in the neck (jugular vein), the front of the shoulder (subclavian vein) or the groin (femoral vein). In some patients, a CVC may be inserted into the vein of the elbow and advanced into the subclavian vein, this type of catheter is known as a Peripherally Inserted Central Catheter or PICC line. When a CVC is inserted, the patient is usually laid fairly flat and a local anaesthetic is used to numb the area before inserting the catheter into the vein. After a neck, shoulder or elbow central line is inserted, the patient will have a chest x-ray to make sure that the line is in the right place. For a more detailed explanation of how a CVC is inserted see Vascular Access. Click on the buttons for fact sheets on CVCs in community languages. These bags are used to inflate the lungs during procedures including intubation. Critically ill patients need to have their blood pressure checked regularly. This provides the staff with vital information on the cardiovascular system (heart, arteries and veins). A large cuff is placed on the patient’s arm or the leg and is manually or automatically. When patients are very ill or unstable the staff may insert an arterial catheter to continuously measure the blood pressure.